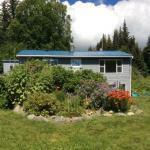 Offering free WiFi and a garden Garden Retreat is set in Homer. Free private parking is available on site. All units have a dining area and a seating area with a satellite flat-screen TV. There is also a kitchen equipped with an oven. A microwave a toaster and fridge are also provided as well as a coffee machine. Every unit features a private bathroom with a bath. Bed linen is offered. The nearest airport is Homer Airport 2 km from Garden Retreat.